online shopping | Badudets Everything Nice! Nowadays an increasing number of entrepreneurs in the Philippines are creating online businesses. You can literally sell anything online, from your own homemade arts and crafts, to tutorials and even your services as a writer, blogger, artist, etc. It’s our second time to use forwarding services, first was Johnny Air Cargo. But since Johnny Air Cargo no longer offer consolidation services for free, we looked for other options. I found Pobox.ph rates very affordable, plus they offer consolidation of your shopped items in the US for free. Same procedure applies, shop in US online stores and have it delivered to their US address (warehouse). They can hold your items for a maximum of 45 days before packing them into a box and shipping it to the Philippines. 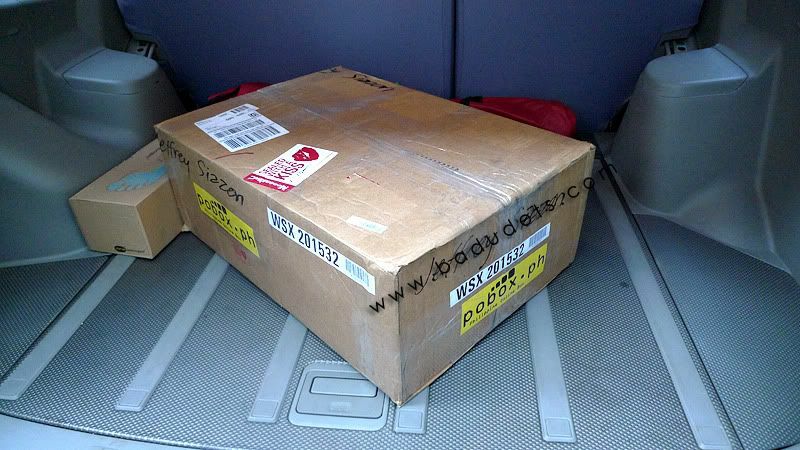 It takes 4 weeks by sea for the packages to reach Philippine shores but they delivered the box door-to-door. Pink Fortune accessories as gifts! Can you feel the Christmas rush already? Christmas bazaars are everywhere and malls are teeming with people, and situations like this makes me more lazy to go to malls. The answer, online shopping in Multiply! Please don’t forget to visit Pink Fortune if you’d like to give accessories as gifts, we now have fashionable clothes too! Online shopping in the Philippines has come a long way, from Multiply, online shops have conquered Facebook. But as I’ve said before, I don’t want to make my personal account in Facebook an online circus of some sort. But what I’ve been considering for months now is to buy a domain name for my site and set it up as a stand-alone e-commerce/shop site complete with shopping cart features. I think Philippine market is mature enough for this kind of shopping experience and I know a lot of Philippine-based online sites that are already successful with this kind of set-up. I already have an existing web hosting for my blogs but I’m afraid that the space/bandwidth won’t be enough to accommodate the existing traffic my Multiply store has. One suggestion is for me to have my own server, but I’m too novice for those technical stuff. Having my own dedicated server might be an advantage for me in the future should I acquire more blogs and online shops but I’m lost with all technical jargons. But I found a great deal in Superb.net with their managed hosting, aside from their managed dedicated servers that I can acquire, it also comes with a 5-in-1 deal which includes managed backup, managed firewalls, OS hardening, patches and updates and proactive monitoring. Looks like a promising plan, right? And if all things became successful, I can even avail of their colocation plans to take care of my server. Just sharing you some of my hopes on becoming a successful entrepreneur, but in the meantime, do check out the latest collection from Pink Fortune, multi-way bags that are definitely bang for the buck! 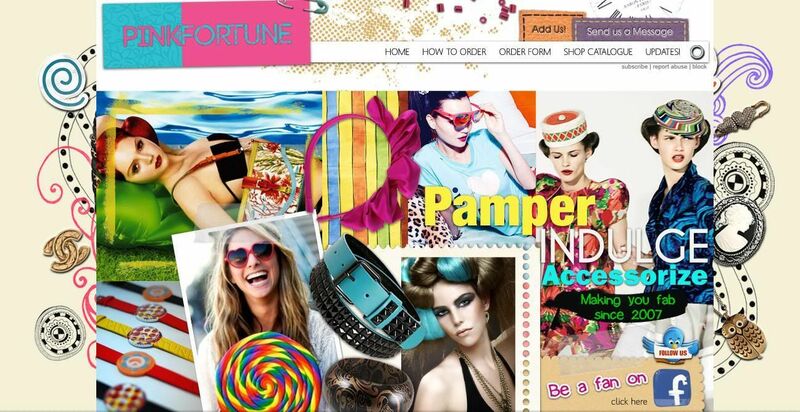 Here I am again, creating an online buzz about my online shop that sells fashion accessories. Sales these past few months are kind of slow. Maybe because competition is stiff nowadays with a lot of online shops sprouting not only in Multiply but also in Facebook. I still refuse to migrate selling in Facebook because Facebook for me, is more of a personal account and I reckon this is also the case for others. So I’m happy with my current online shop in Multiply and swore to myself that I will not tag my friends in Facebook about my wares. I’ll just find other ways in increasing my sales without being too pushy and with a code of ethics in mind. One way to promote my online shop, Pink Fortune, is through classifieds. 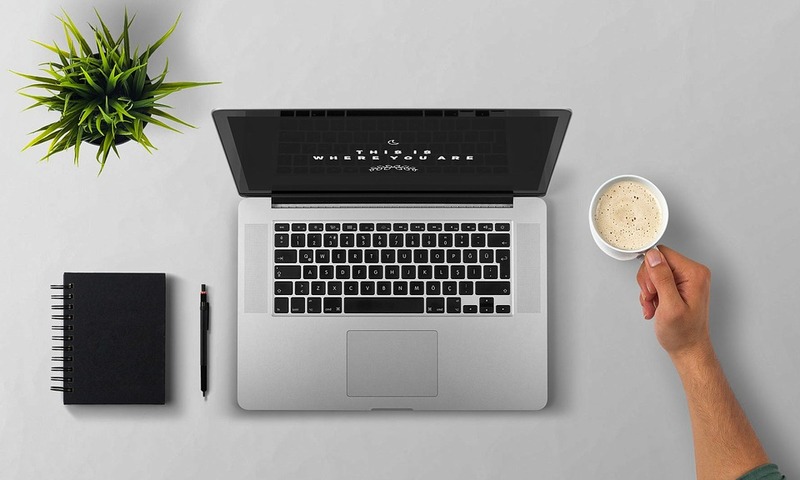 Just like including our blogs in link directories, listing our online shops in different classifieds and directories will make it more visible to prospective customers and buyers. It’s also free so there’s nothing to lose, just hardwork and patience because creating and posting classifieds can be quite tedious especially when manually entering the details. But I promise, you’ll gain a sale/s from these listings. I once read that in sales, one must not stop marketing his/her products. It’s been a more than a year since I changed my online shop’s layout, Pink Fortune. Maybe one of the reasons of my online selling hiatus for a few months is because I got tired of the new layout. I asked Ann of Design.Create.Art to revamp my site last April, but she got busy until now. Finally, my Multiply online shop has a fab new look and I love it to bits! Online sellers and merchants like me are always on the look-out for something new to offer to their buyers. Merchandise should always be updated and stocks should always be replenished so that no sale is lost. With plenty of competitors in the business, most likely, some online sellers have the same products with other sellers. This can’t be avoided especially if you get your goods at the same suppliers. For some, crafting like making use of different materials sets them apart because they offer unique and one-of-a-kind items. But for busy people like me, importing products from other countries will ensure that my items will be different from others. 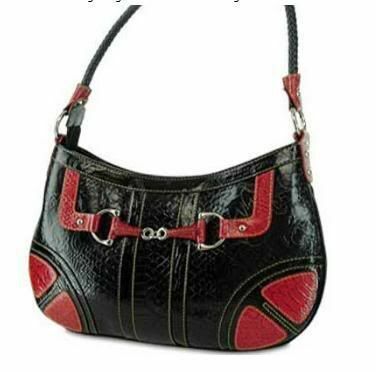 There are plenty of suppliers available in the web for wholesale fashion accessories, wholesale wallets, wholesale clothes, etc. 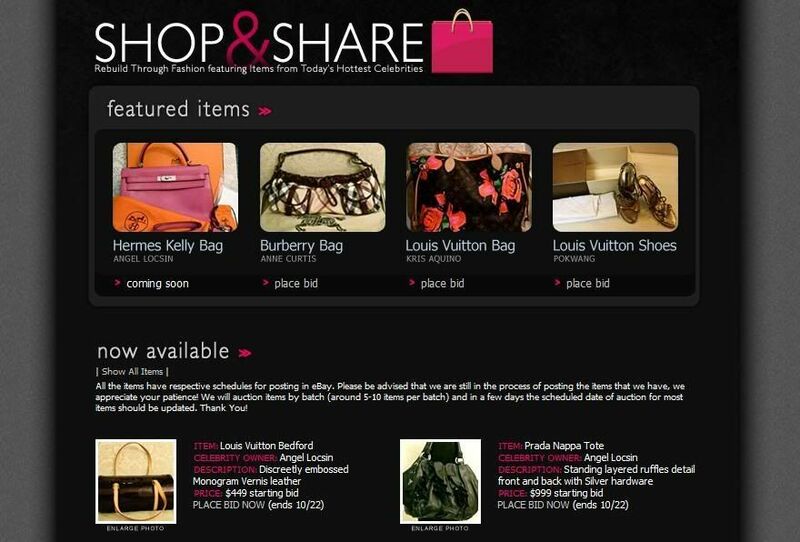 Shop and Share (ShopandShare.ph) is an auction site put up by celebrities Angel Locsin, Anne Curtis, Kris Aquino and other ABS-CBN talents. Celebrities donate their personal items to be put up into auction, proceeds will then go to the Philippine National Red Cross’ disaster relief efforts. The site was brought about by the recent disasters that hit Philippines, typhoon Ondoy (Ketsana) and typhoon Pepeng (Parma). Until now, running a shop on Multiply has technically been a violation of our terms of service. As long as you didn’t spam anyone though, we simply looked the other way and let you go about your business. I know that this policy didn’t exactly give you all a lot of comfort, so I’m happy to announce that we’ve updated our terms of service to reflect the fact that running a shop on Multiply is now an officially endorsed activity. Aside from being a blogger, I’m also an online seller at Multiply, in fact, I’m enjoying this sideline for 2 years now. I get to do things I love which is to shop and do crafts like beading. Earning from it is just an added bonus as well as gaining friends along the way. 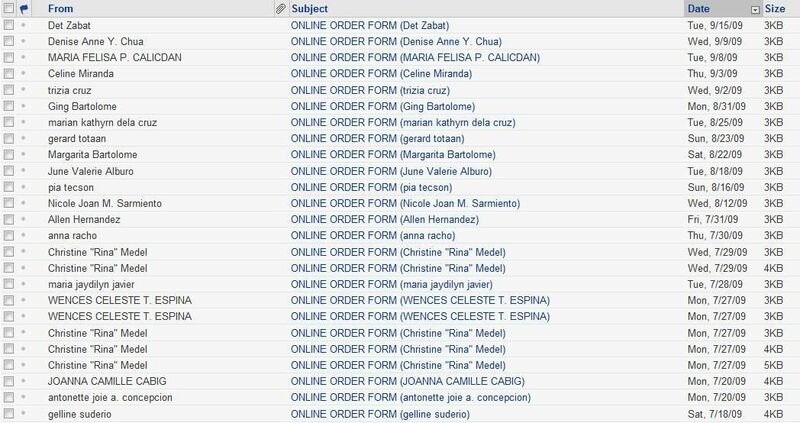 Maintaining an online shop is quite a task, I have to check everyday for inquiries, post blogs and ads about new products, update my clients for the status of their orders, checking if they have received the items in good condition, etc… Aside from the online inquiries, I also get inquiries and orders thru text messages even in the wee hours of the morning. That’s the beauty of online shopping, you can shop 24/7 at the convenience of your own home and with only just a few clicks.